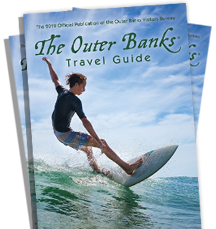 The Outer Banks is 105 miles of sand, sea, surf and sunshine, and you can ride all 105 of them. From Duck down to Ocracoke, rich salt marshes give way to pristine beaches giving you the peace of mind you’ve been missing. With many bike paths and wide paved shoulders, you’re sure to find an interest for leisure riders, serious cyclists and the entire family. The landscape is almost entirely flat with the exception being a few bridges, and there is almost always a breeze blowing in your face regardless of the direction you’re heading. You'll notice yellow "Bicycles - Share the Road" signs all through Dare County on US 158, US-64 and 264, and NC 12. We even have some official NCDOT-marked bicycle routes. As for the mainland, you can ride through miles and miles of rich farming country and wildlife preserves on main and side roads with little traffic to worry about. For leisure family riding, especially with children, multi-use paths are available in most of the towns and villages for slower-paced touring or for a relaxing afternoon ride. There are paved separate routes, which wind along parallel to the highways or through wooded areas. Some of them connect you from town to town without having to brave the motor vehicle traffic. For faster and more experienced riders, there are many wide paved shoulders to provide separation between cyclists and motor vehicle traffic. Fast cyclists are cautioned about using the multi-purpose paths because of the presence of walkers, joggers, roller bladers, and children on bicycles. The shoulders of the roads might be a better choice when the foot traffic is heavier than the road traffic. Just be sure to ride on the right, not on the left. Another word of caution, summer is not the best time for on-highway cycling due to the high volume of tourist traffic. As always, please use caution and have fun.